EU leaders have been getting down to business in Brussels – with the migration crisis, Turkey, Russia and Syria among the pressing issues on the agenda of their last summit of the year. Commenting on the unfolding developments in Aleppo, French President Francois Hollande talked about a humanitarian ultimatum. One that demands that the threatened population be allowed to leave the Syrian city, a humanitarian corridor opened. “In the coming hours,” he told reporters as he arrived in Brussels, “if efforts are not undertaken, the regimes backing Bashar al Assad will bear the responsibility of this extremely grave situation. On migration, Brussels is working to curb the flow of people from Africa to Italy by putting pressure on governments there via aid budgets. And by preparing to step up the deportation of illegal immigrants. “We have worked out – this concerns all migrant partnerships – that development, security and the fight against human smuggling must always go together, so that people do not get in danger,” said German Chancellor Angela Merkel. Britain’s prime minister was expected to give an update on preparations for the UK’s divorce negotiations. But there was no dinner invite for Theresa May. “As we are going to invoke Article 50, trigger the negotiations by the end of March next year, it’s right that the other leaders prepare for those negotiations as we have been preparing,” said May, as she arrived. 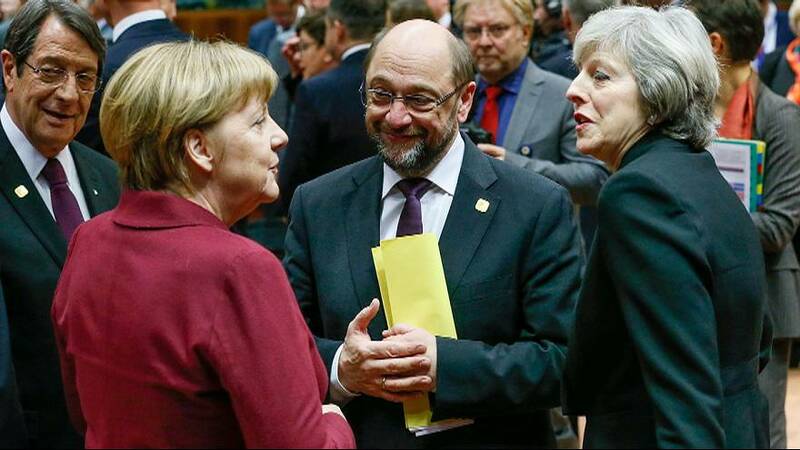 Brexit could cause the biggest rift of all among EU leaders, as they finish 2016 grappling with a number of crises – against an ever-changing political backdrop.